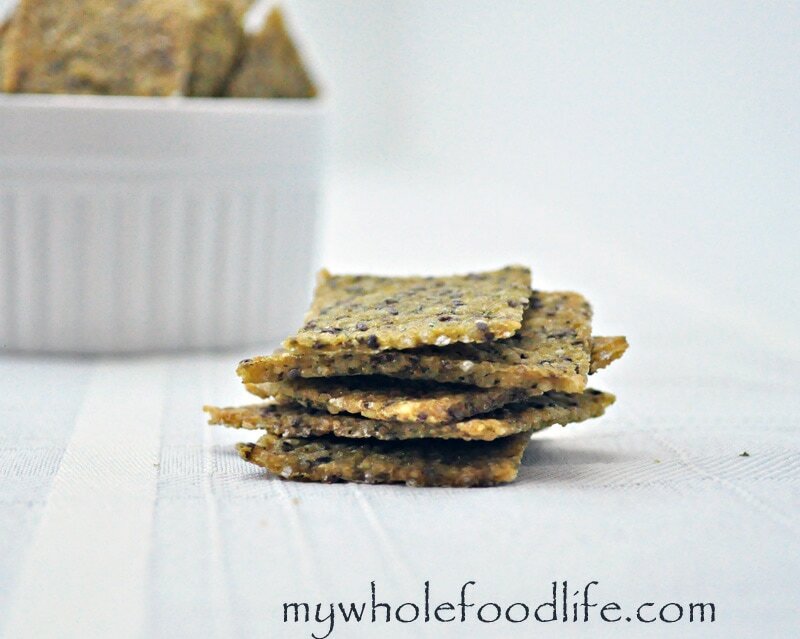 When I made my Homemade Wheat Thins the other day, a lot of you wanted a gluten free cracker as well. This recipe is more for adults than kids, but it’s so good! But first, let me tell you about the giveaway. If you need help on your knife skills like I do, this giveaway is for you! I used this mezzaluna from Joseph Joseph to cut the herbs in this recipe. Let me tell you it worked so well! Makes me wonder why it took me so long to get one! 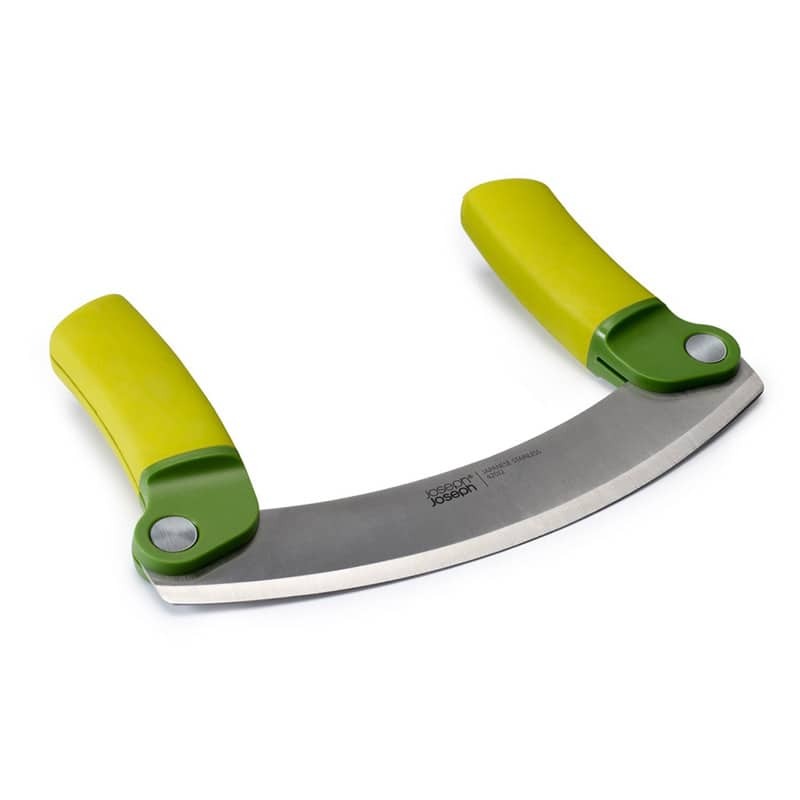 Joesph Joseph is also going to give a mezzaluna to one lucky winner. Contest is open to US residents only. Winner will be chosen on Tuesday, August 27, 2013. Good luck! Now onto the recipe. In a food processor , blend up the rice and the chia seeds. Then add in the remaining ingredients and pulse until a dough starts to come together. Tear two pieces of parchment paper the size of your baking sheets . Place 1 piece of parchment on the counter top. Put half the dough onto the parchment. Tear some plastic wrap to put between the rolling pin and the dough. This will prevent the dough from sticking to the rolling pin . Roll the dough out pretty thin. Transfer the dough and the parchment paper to a baking sheet. Repeat these steps with the other half of the dough. Remove the pans and carefully cut the dough into squares with a pizza cutter . Carefully flip each square over and bake for another 15-20 minutes, or until crispy. You can probably do the whole thing in the dehydrator as well if you want to keep them raw. I got around 30 crackers in my batch. Store them in a container with dry rice scattered at the bottom. The rice will absorb the moisture and keep the crackers crispy. Enjoy! Just made a batch of these, and almost ate the whole thing myself. They were super easy, and I think they are a great base for other recipes. I'm hoping that I can find the right moisture balance for one with oregano/basil, tomato paste/red bell pepper, and nutritional yeast, similar to pizza kale chips I've made before. Thanks for the inspiration! Made these tonight with quinoa. They were tasty, but I had a hard time flipping them over because they were sticking to the parchment paper and I felt like I lost a lot of dough on it. Is that normal? I'm sorry you had that problem. :( Not sure what could have happened. Servings made for these ingredients? The recipe seems great, thanks. I added the link to my pinterest board (contains soy free, wheat free, etc: allergy friendly recipes and healthy food options).